When my younger brother was around Tigger’s age, he discovered Pokemon. He would watch it on the TV, collect all the cards and video games. Fast forward many years later and the introduction of the Pokemon Go app has since the revival of the Pokemon age. POKÉMON: THE FIRST MOVIE – The adventure explodes into action with the debut of Mewtwo, a bio-engineered Pokémon created from the DNA of Mew, one of the rarest Pokémon of all. After escaping from the lab where it was created, Mewtwo is determined to prove its own superiority. It lures a number of talented Trainers into a Pokémon battle like never before and of course, Ash and his friends are happy to accept the challenge! POKÉMON THE MOVIE 2000 – In the Orange Islands far south of Kanto, a Trainer named Lawrence is on a sinister quest: catching the Legendary Pokémon Articuno, Zapdos, and Moltres in an attempt to awaken Lugia, guardian of the sea! When Ash and friends arrive, the islanders ask him to gather three elemental orbs from different islands. As the weather across the world goes out of control, it becomes clear that the capture of the Legendary trio has thrown the environment out of balance! With Lugia s help, can Ash find the orbs, restore the balance, and be the chosen one that everyone turns to? POKÉMON 3: THE MOVIE – A crystal catastrophe is unleashed upon Greenfield, and Ash, Pikachu, and friends must figure out how to undo the damage to the once-beautiful town. But the unthinkable happens when Ash s mother is kidnapped by the powerful Entei, a Pokémon thought to have existed only in legend. Now Ash must go to her rescue, uncertain of what he ll uncover when he unlocks the real secret power behind the unbelievable turn of events: a young girl whose dream world is being turned into a nightmarish reality by the mysterious and unstoppable Unown! 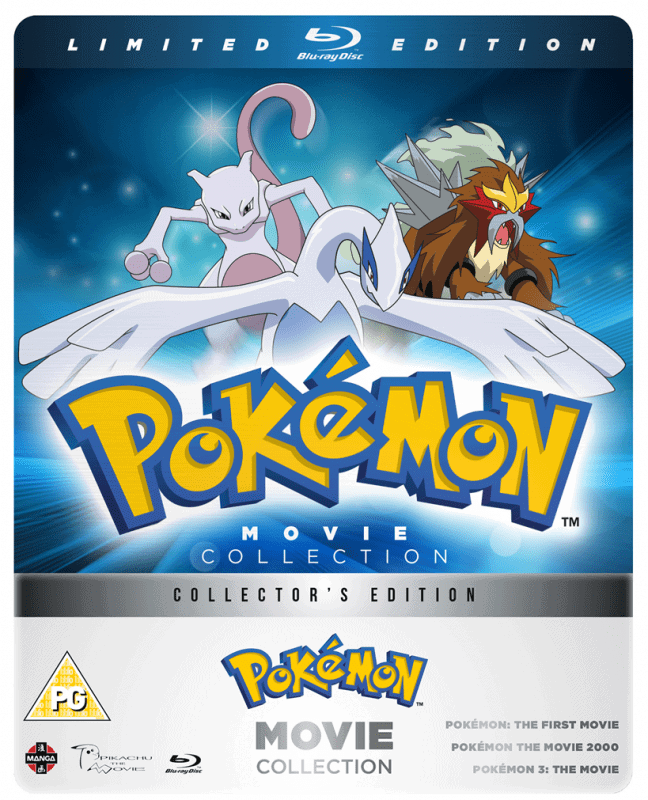 To help you relive the classic Pokemon movies, we have kindly been offered a Pokemon Movie 1-3 Collection – Limited Edition Blu-ray Steelbook to giveaway to one lucky reader. My Little boy would love these so much. He as been collecting pokemon stuff since he was 2 after watching it with me one day. My fave character is Ash Ketchum. I cried during the first film, when I watched it as a child *cringe*. My favourite when I was younger was always Eevee due to the fact it can evolve into 3 different types (think its around 7 types now) but I always loved Charizard too. We love Charizard 🙂 ive been a huge fan of pokemon since 99! so im chuffed my kids now love it since #Pokemongo! would love to win this for them. Jigglypuff is my favourite, so cuuute! Snorlax is my favourite. I envy his lifestyle! I like Chimchar, a cheeky monkey. My son likes Mewtwo and Pikachu. Pikachu is my favourite, hes so cute! i always liked bulbasaur, cute! My favourite is eggecute. They look so cute but so angry at the same time. im a huge fan of Jigglypuff and the naughtyness that happens when she sings, although had to explain to my daughter that drawing on faces when people are asleep is WRONG! Pikkachu- I dont know many of them! This will make a fantastic birthday present for my son! Your blog is so similar to that of my daughter Summer. She is now 22 and is still a gamer. She loves her Cosplay. When Pokemon Go! was released she said all her dreams had come true as every birthday or wish she was granted she would wish that Pokemon was real. Her favourite is still Charizard. My favourite is wartortle but my 4yo his favourite is pikachu. Psyduck has been my favourite ever since I was little. I Just Adore him. Charmander is our household favourite! It’s a toss up between Jigglypuff and Psyduck! I will have to say Jigglypuff! Pikachu, because he’s so cute! Pikachu – is that how you spell it?! I guess Meowth. I didn’t really get into Pokemon (bit too old when it first came out), but I have friends and family that are massive fans. I’d give this to one of them. I think it’s SlowBro for me. My favourite is Jigglypuff – so cute!! I say Archer from the team rocket. I think it has to be Pikachu. Our favourite is Togepi, I have a Pokemon mad daughter of 7, half the time i have no clue who she is on about but amazed that she can remember and pronounce so many unusual names!! Snorlax is my favourite pokemon of them all.